Great traditions. An incredible multitude of cultures. Charming cities. Suggestive landscapes. Fascinating itineraries. And a reliability and organizational efficiency that has few equals. 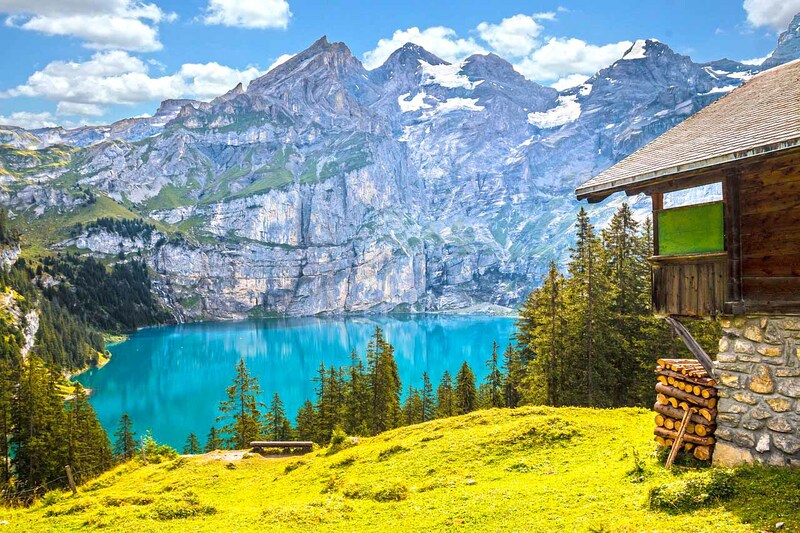 Switzerland is a truly beautiful country, striking at first glance. There are so many reasons why it is worth organizing your holidays in this place. Between plane, train, bus and car, you will be spoiled for choice to reach your destination. The aircraft is one of the best solutions to cover medium / long-haul distances. The international airport of Zurich-Kloten, it is one of the busiest in Europe, well connected to the main European and extra-European destinations. EuroAirport, not far from Basel, it is the first and only trinational airport in the world. Also in this case, direct connections are numerous and frequent. Geneva also has an important airport stopover, the Easyjet company's hub. Given its central position, Switzerland is one of the most important railway hubs in Europe. You can arrive by train from the main European destinations. From France, there are fast connections by TGV to Paris, Avignon, Dijon and Nice. With the ICE Intercity Express trains, you can reach Hamburg, Frankfurt, Berlin and Amsterdam. Connections with Milan and numerous Italian destinations. Other options include EuroCity trains and night trains to / from Prague, Vienna, Barcelona, ​​Milan, Rome and other destinations. By bus, Eurolines and Filobus are the best solutions to arrive for quality - price. If you want to arrive by car, please note that you must purchase the appropriate cartoons to travel on Swiss roads and motorways. Furthermore, customs controls are often frequent, even for no apparent reason. Often, at peak times, you may find queues important enough. The motorway network is integrated into the European system and you can reach the main destinations without leaving the motorway. From Milan, you have to travel about 290 kilometers. From Salzburg, Austria, about 450 kilometers on A8 and A96, passing near Munich. From the French Marseille to Geneva, you travel about 460 kilometers, almost entirely on A7. The Swiss Federal Railways (SBB CFF FFS), represent the flagship, extended for over 5000 kilometers and interconnected with road and lake transport. The Swiss railways were able to go where no one had pushed before. This is the case of the Jungfrau Railway, the highest line in the whole of Europe. By train, you can easily move around the country. The connections are really capillary and the prices quite convenient, especially using the comfortable SWISS TRAVEL PASS. These are special tickets, valid from 3 to 15 days, which allow you to travel on all Swiss trains. So you can easily move from one place to another. Ideal to reach more destinations during your holiday. Prices for adults vary from a minimum of 225CHF (3 days pass) to a maximum of 485CHF (15 days pass) in 2a class. Alternatively, you can travel by plane, even from smaller airports such as Berne. The aircraft, in any case, is not the ideal solution because of the costs and "dead times". Really fascinating, and evocative, is the solution by river. Many shipping companies offer transfers throughout the territory. For example, you can cross the whole of Lake Zurich and reach picturesque destinations such as Rapperswil. A truly unique and fascinating way to move. There is no obligation to produce documents at the border, but you are always required to bring an ID card or passport with you. It is recommended, above all, to bring the CI of their children under age, even if traveling by car or train. See our special section, about that. Dogs and cats enter freely, provided they have a health certificate and a recent certificate from the veterinarian of the ASL of residence, attesting to good health. Dogs must be vaccinated against rabies for at least 30 days. Please note that the appropriate microchip must be applied to the animals. To fly with animals, please refer to the individual section Airline companies. The official currency is the FRANCO SWITZERLAND, shown as CHF. In circulation you find coins from 5, 10, 20 and 50 cents, from 1, 2 and 5 francs and banknotes from 10, 20, 50, 100, 200 and 1000 francs. In September 2018, 1 CHF is equivalent to about 0.89 € and 1.03 $ American. Almost everywhere, you can pay directly by credit card and withdraw cash at ATMs. Keep in mind, however, that in some small cities, and less touristy places, you may find it difficult to make credit card payments. A cash reserve is always recommended. Who needs to enter Bank, keep in mind that, in the main cities, it is open from Monday to Friday from 08: 30 to 16: 30. Schedules may be subject to change; in small towns, in fact, the counters pause from 12 to 14. Everywhere, banks are closed on Saturdays and Sundays. In Switzerland, the clock hands are placed one hour ahead of the Greenwich meridian (UTC / GMT + 1). Daylight saving time starts on the last Sunday in March and ends on the last Sunday in October, with the hands forward an additional hour compared to Greenwich (UTC / GMT + 2). Throughout the country, the voltage is 230 volts, with 50Hz frequency. Typically, you will find electrical sockets type C, or bipolar, and jacks of TYPE J or tripolar, like those in photos. We recommend always using a special adapter. To the most provident,we recommend taking a look at this link. Swiss Post, is the company that manages the postal, logistic and financial services of the country. It is the most important public company in the whole country, born in 1998 from the PTT split. Generally, it is identified on the outside by a red logo, the word POST and a yellow background. The latter, in general, characterizes the post offices of the country. The company offers all common shipping and telecommunication services. Efficiency and reliability are the prerogatives of Swiss Post, on time .... like a Swiss watch !! Typically, post offices open, from Monday to Friday, from 08: 00 to 11: 00 or 12: 00 and 15: 00 to 18: 00; on Saturdays, from 09: 00 to 12: 00. Almost everywhere, they are closed on Sundays. Schedules, however, may vary by location. The shops are generally open from Monday to Friday, from 08: 30 to 18: 30 and Saturday from 08: 30 to 16: 00. Times vary depending on the area. On Sundays, in fact, in the main cities you may find special openings during the morning. In smaller areas, however, stores make a gap between 14: 00 and 16: 00. You could often find, merchants closed on Monday morning. The sign Apothek outside the building, indicates the presence of a pharmacy. Usually, in the city, they observe the same store hours, and are open from Monday to Friday, from 08: 00 to 18: 00, and Saturday until 16: 00. You can find pharmacies at the main railway stations and airports; in this case, they are also open on Sundays. Even in terms of medical care, Switzerland has few equals in terms of efficiency and reliability. Each hospital is equipped with an emergency room. Make sure you are covered by an adequate insurance beforehand and possibly stipulate an additional insurance before leaving. Take your health card with you. In Switzerland, the frequencies Gsm 800 / 1800 Mhz and W-CDMA 2100 are used, the same as the main European countries. So you can easily use your Italian, French ... smartphone. To call phones in Switzerland, you need to enter the international code 0041, followed by the telephone number. With the reduction of roaming costs, you can easily call from the country using your national tariff. Alternatively, you can use the classic VoIP calls, or make video calls, using a free WI-FI line.